and always ensure you ask the following questions to allow you to make an informed decision. 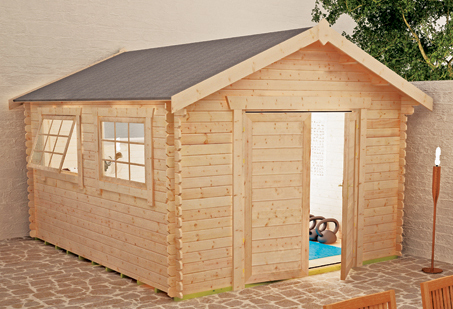 What type and quality of timber has been used to make the cabin I am about to buy? 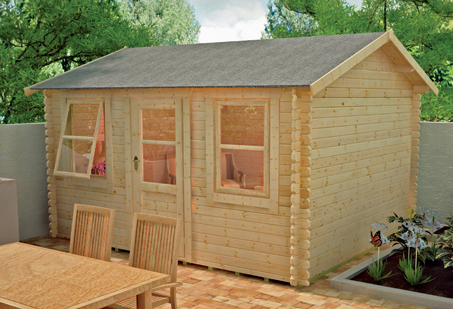 - All of our 28mm and 44mm log cabins are comprised only of extremely high quality timber. Our logs are constructed primarily with European RED WOOD timber which is a naturally smoother and of a better finish than other inferior types of wood. This includes fewer knots and splits and a much longer lifespan. - Most (if not all!) 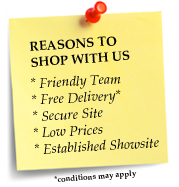 of our competitors use Baltic white wood, quite simply because it is cheaper to buy in and more readily available. WHITE WOOD is much more prone to warping and splitting. Baltic timber grows quickly and therefore the grade is not as high and the quality is not as good as a slow grown European redwood. - We do NOT import our log cabins. Woodlands have their own mill, here in Yorkshire, owned and staffed entirely by them. This gives them complete control over the manufacturing process meaning they can oversee the quality of our timber. Any timber found to be inferior is simply not used. 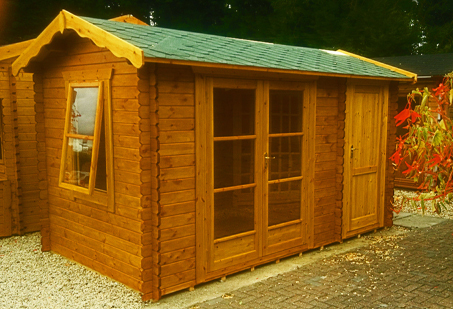 - Most other online log cabin retailers do not have their own mill and are likely to import their log cabins from abroad. This leaves you, the end customer, with no idea where the product has actually come from and who has been responsible for its manufacture. 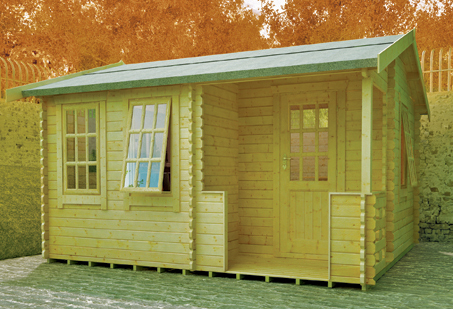 As a result many competitor log cabins have therefore been sat in stock or left dock side for months on end – ours are fresh and made to order! 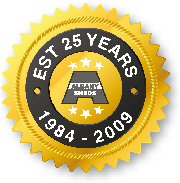 Furthermore, if you bought an imported log cabin and any component was missing, incorrect or damaged upon arrival you may be waiting months for a replacement component to get to you! 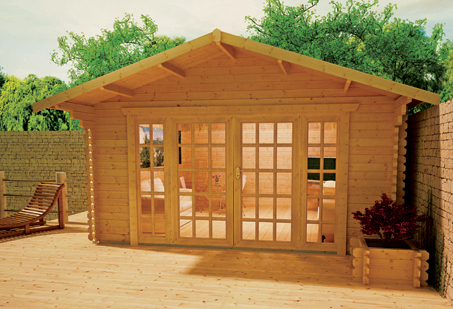 - Our log cabins feature oversized extra large doors and windows. Our doors and windows feature high quality glazing which is factory siliconed, fully draft sealed and beaded internally and externally. Most importantly, our log cabin doors and windows are internally hung (like traditional house doors and windows). 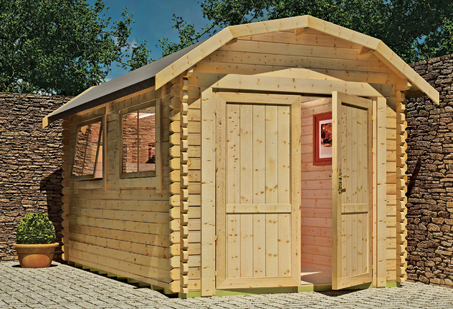 - The majority of competitor log cabins have externally hung doors and windows (typically using lower quality pin hinges) – these are much more prone to twisting and warping. 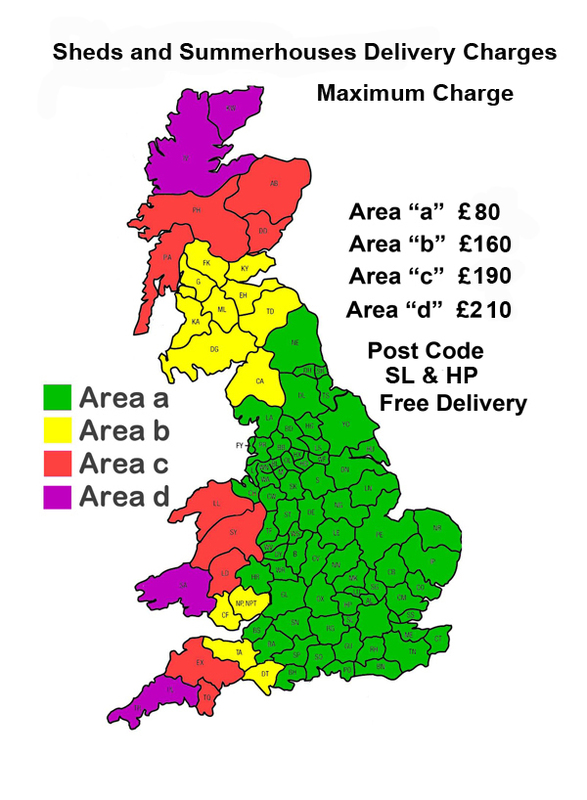 They tend to use cheaper narrower doors which can prove difficult for access. Many competitor’s log cabins’ doors and windows are not draft sealed – leaving you with extra work to do to finish the building. 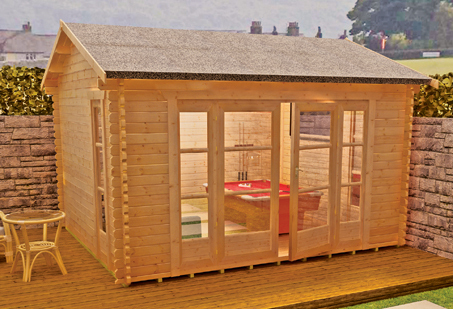 - Our log cabins feature a specially designed and unique four way chamfered notch-joint system ensuring an incredibly tight fit to all boards and allowing no room for damp or wind penetration. We also rebate our roof purlings to ensure there are no visible gaps in the roof construction. 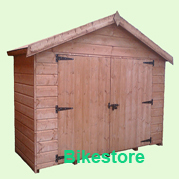 - Many competitor log cabins feature a simple two way chamfer or even no chamfer to the joint at all. Cabins that feature square cut logs with a square notch-joint often leave a sloppy joint with large visible gaps that are susceptible to the elements. 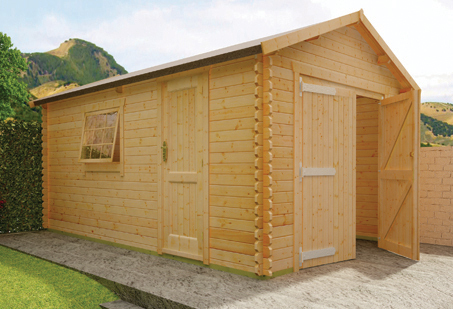 - Our log cabins are extremely high at both the eaves and at the ridge providing maximum usable space within a given footprint base size. In certain circumstances the planning office states that if a log cabin is to be made within 2m of a boundary it has to be under 2.5m in height. For those customers who require a lower height, we can offer to reduce this height on the majority of our log cabins for no extra cost i.e. we give you the most possible cabin for your money and allow you a choice if you need to reduce it! 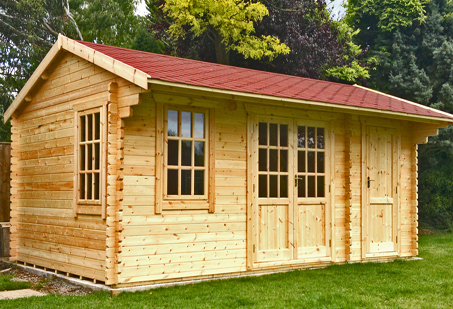 - Many competitor log cabins are already very low and they are not flexible enough to offer the customer any variance in heights, simply because they import their log cabins. 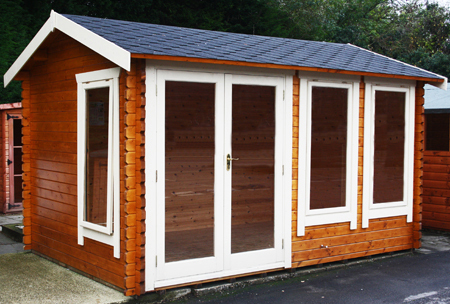 Low cabins can make it difficult to stand up, offer no potential for roof storage and reduce the overall internal volume of the building. 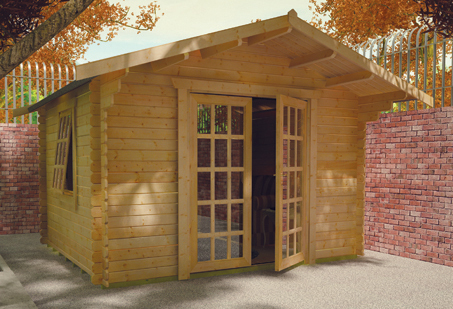 - Our log cabins are made with decorative brass handles with a high quality integral three lever lock. These are the sort of locks you would find installed on the door of a house or secure office building. 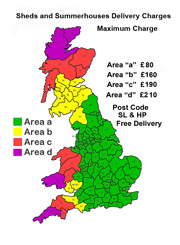 - Many competitor log cabins use cheap and less secure European cylinder locks putting your belongings at risk. What if I want to make a change to the design of the cabin I am about to buy so that it is tailored just for me? 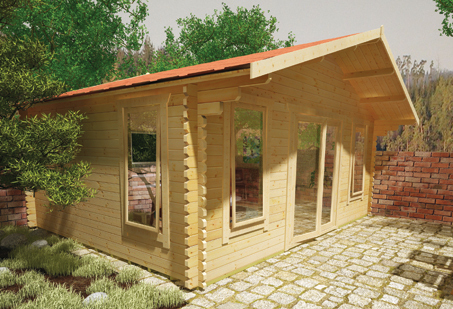 - As the manufacturers of all of our own log cabins, we can be very flexible with design. 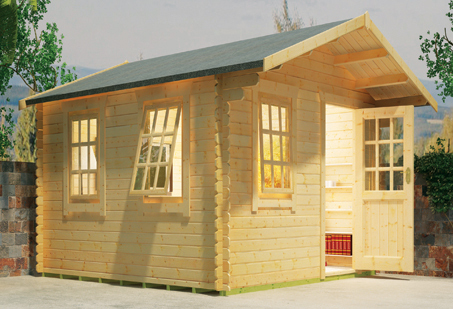 Therefore if you need a specific size log cabin, wish to add on doors, windows, partitions etc. 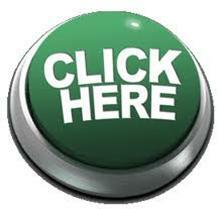 then simply give us a call and we will get you a price. 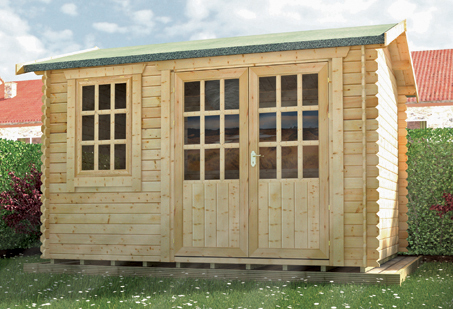 - Most competitor log cabin companies will not offer this amazing service, the only cabins they can sell you are the exact ‘off the shelf’ cabins displayed on their website or in their literature. This can be frustrating especially considering the expensive nature of such a product. 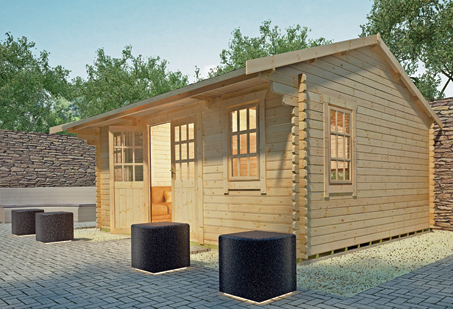 TAKE THE TIME TO THOROUGHLY GO THROUGH EACH OF THE ABOVE QUESTIONS BEFORE MAKING YOUR LOG CABIN PURCHASE AND WE ARE SURE YOU WILL AGREE THAT OUR CABINS TRULY DOES PROVIDE THE HIGHEST QUALITY AND BEST VALUE FOR MONEY LOG CABINS AVAILABLE ON THE MARKET TODAY.